Firefighters are to be balloted over the summer on possible strike action over proposed changes to pensions, the Fire Brigades Union (FBU) has said. 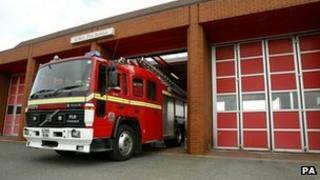 The FBU, which described the changes as "unworkable", said the ballot would take place from 18 July to 29 August. The union said the vote was prompted by a government deadline of 12 July for firefighters to accept the proposals or face the imposition of the changes. Fire Minister Brandon Lewis said he was "disappointed" at the decision. The FBU argues the changes would impose a sharp increase in members' contributions and put firefighters at greater risk of dismissal without access to a proper pension if they cannot maintain fitness standards as they approach the retirement age of 60. It claims the current proposals would see firefighters who retire or are forced out of work at 55 losing about 50% of their pensions. FBU general secretary Matt Wrack said: "Expecting large numbers of 60-year-olds to fight fires and rescue families is dangerous to the public and to firefighters. "The government is simply ignoring the evidence about the physical demands of firefighting and has been unable to answer our concerns during two years of negotiations. "None of us want a strike, but we cannot compromise on public and firefighter safety. We hope common sense prevails, and the government returns to the negotiating table." Dates for any walkouts will be announced later if there is a vote backing industrial action, the union said. Fire Minister Mr Lewis said: "The government has listened carefully to concerns and put an offer on the table where a firefighter can collect a better pension at age 55. "The majority of firefighters will see no change in their pension age and will be able to take their protected final salary pension when they expected. "The government had already recognised the unique job that firefighters do by setting the same pension age as the police and armed forces. Even after the reforms, firefighters will continue to get one of the most generous public service pensions available - someone in the private sector would have to contribute twice as much to get the same pension. "Local fire and rescue authorities have good contingency arrangements in place to ensure that the public are protected in the event of industrial action."